Thanks for posting them Dan. The administrator of Collectors-of-Schrades-R.us is a long time AAPK member (11 years) by the name of Larry Vickery, (LRV). Larry is a great guy and very knowledgeable in Schrades and knives in general! His website is a great contribution two cutlery history, especially for those who collect Schrade and Camillus knives! He has preserved an enormous amount of cutlery history on his website. And to top it all off is a really nice guy! It certainly is a great website. Lot's of cutlery history regarding other manufacturers as well. Larry was incredibly accommodating, he answered my first email to request permission within an hour or so. He asked that I give him time to put together a pdf of the Keen Kutter catalog without the water marks he had put on his site. The next evening he emailed me a pdf without the watermarks. I don't know Larry, but sure have appreciated his work. Thank you Dan. 1940 Stoeger's Shooter's Bible knife section. Boker Tree Brand, WISS scissors and straight razors. Great stuff on the Keen Kutter knives. I now am almost blind from reading the pattern #'s! They have been of interest of late! 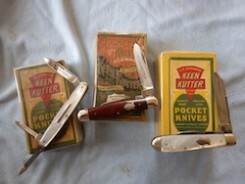 I know what you mean Phin, I have been looking thru them for a Keen Kutter Jack I have. This is really great, that people have old catalogs like this and share it here with us. Thanks to all of you. I just got this old gun knife catalog and there is a page on Korn Auto's, pretty cool. Great for auto fans. I'd like to have a dog in that hunt. Sears 1975 Fall/Winter catalog ad for Sears Craftsman pocket knives.